Karl Hartwich is probably the best Dutchman-style concertina player of his generation. 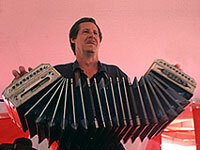 A prodigy on the Chemnitzer concertina, Karl started his band, The Country Dutchmen, in 1973 at age 13. His instrumental innovations have won him devoted followers and stimulated a revival of Dutchman-style polka. Karl has won the band of the year for the Wisconsin Polka Hall of Fame twice, once in 2001 and once in 2007, and has performed in about 30 states. Linda, Karl’s wife, is an excellent polka dancer who can instruct on various dances. The goal of their school programs is to make younger people aware of traditional music and instruments. Electricity. Staging area for band to set up. Winter months—flexible for weekdays, evenings and weekends. Best to contact after 12 PM if by phone.